Advance Formwork offer the latest in edge protection. 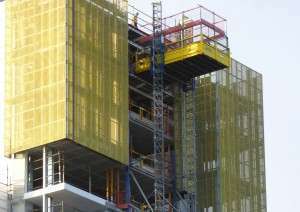 These screens offer protection all the way up to the top levels of high rise building blocks. They are hydraulically jumped and because they are structure-guided at all times they can even be jumped in windy conditions. They can be quickly repositioned by crane also, if required and craneage permits. They eliminate the possibility of debris from live working floors falling from the building and causing injury. This greatly increases the safety of site workers and the general public. They also prevent people from falling over the edge. Prefabrication of the screens is all done off-site and is tailored to each specific project. This reduces cost and use of onsite craneage. Screens would typically be prefabbed in 12 meter high by 4 meter wide sections allowing huge areas of screen to be installed with minimal lifting.